Swansea manager, Michael Laudrup has taken responsibility for his side's penalty mix-up after they crushed League Two side Bradford City to win the Capital One Cup at Wembley. Laundrup admitted that he had forgotten to nominate a penalty taker when Nathan Dyer, who was on a hat-trick, and Jonathan de Guzman were involved in an amazing row over a 59th-minute spot-kick. Bradford keeper Matt Duke was sent off for bringing down Dyer, but the Swans were already 3-0 up and well on the way to their first major trophy. 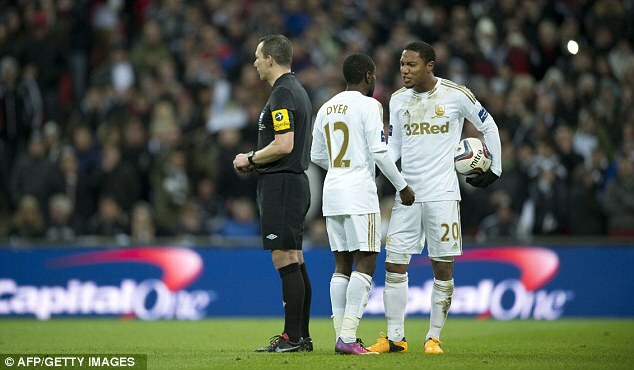 Dyer (2), Michu and De Guzman, who scored the penalty and finished the job in the final minute, sent 30,000 delirious Swansea supporters in to next season’s Europa League. Laudrup added: ‘Nathan is fine. He missed a couple of chances in training and I told him when it came to the final to make sure he put his left boot on his left foot and his right on his right. Dyer said: ‘I had two goals and it’s not every day you get the chance for a hat-trick at Wembley so I wanted the third, but I didn’t get the chance and that was that. Laudrup said: ‘I don’t think I can compare this with anything I did as a player because it is one thing to win a trophy with Real or Barcelona or Juventus and another to win something with a smaller team like Swansea. ‘Now we will play in the Europa League. Maybe we will be in the last qualification round, so that guarantees us at least two games. Bradford boss Phil Parkinson said: ‘The referee should have used his discretion and allowed him (Duke) to stay on the field, but we were well beaten. The supporters stayed with the team and it’s an enormous achievement for a team from the fourth tier to get to a major final. I would love to have won it but Swansea are an incredible side. There are things we could have done better. It was a big day but to beat Wigan, Watford, Arsenal and Aston Villa over two legs is unprecedented for a team at our level.